Large backyard - great for kids! Welcome to our piece of Cape Cod heaven! 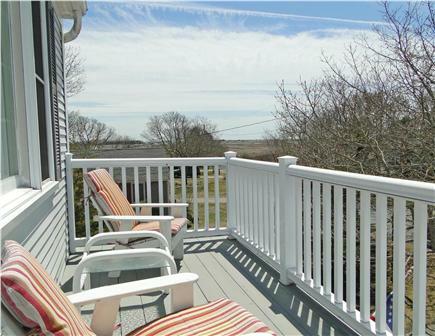 We are located in a fantastic beach area, with nice views of a salt marsh, river and Nantucket Sound. The property also abuts woods and a nature reserve. 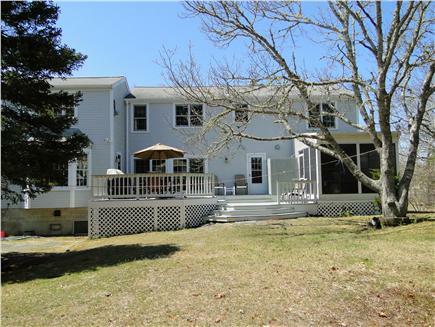 This generously spacious five bedroom, three bath home has over 3000 sq ft of living space. 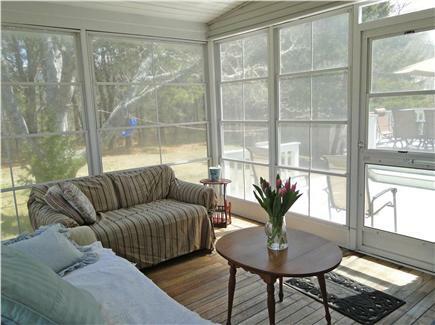 It has a 500 sq ft. deck off the back, in addition to two separate decks at the front of the house and a screened porch. 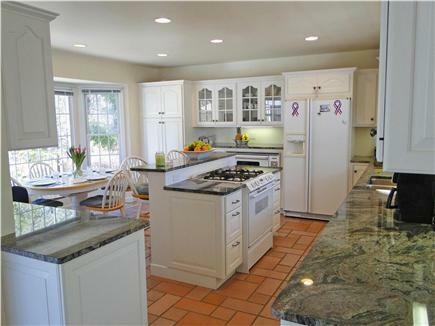 Check out the gorgeous huge gourmet kitchen with multiple grills and ovens. 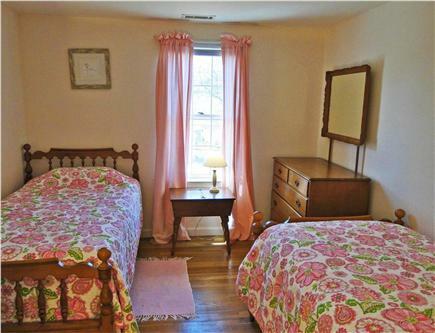 Very large first and second floor master bedrooms. The upstairs one has an oceanview sitting room with fireplace, breezy deck with water views, a large marble whirlpool bath and more. The home has central air conditioning to keep you cool, should you wish to use it, as well as a dishwasher, washer/dryer, cable TV, Internet and an outdoor shower. Start your day with morning coffee or tea on the back deck or sun room in the early morning sun, listening to the sound of nature around you. Head for the beach for a walk or run and enjoy the solitude before the beach goers arrive for the day. Later on, head back to the beach for a day of sun & fun. Or fish, sail or visit the shops around town. Be sure to visit the many picturesque towns or villages and beaches on the Cape. 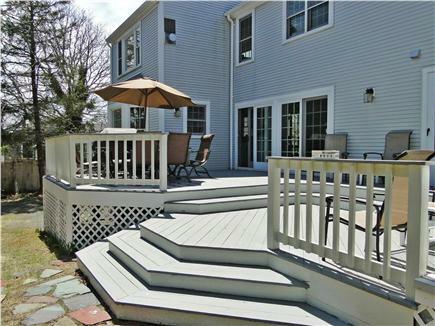 Relax in the afternoon sun on either of the front decks, hammock or bench with sunlight dappling through the trees. Listen to sounds of the ocean on southern winds or your own music from one of the Bose units. Additional pricing info: For multiple weeeks a discount applies No cleaning fees, State and local taxes of 14.45% will apply. 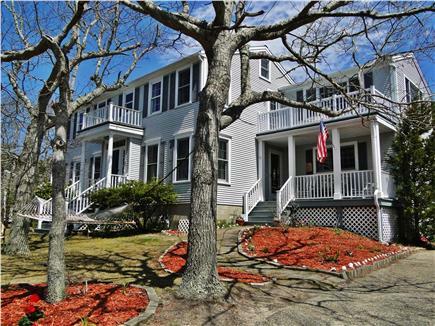 We have been vacationing on the Cape for over 35 years and we have stayed in many different homes. With our growing family, 7 adults and two children ages 3 & 1, this home was a perfect fit for us all. The house was clean, modern and spacious allowing us to have our own privacy when needed. The neighborhood was quiet and everything was in close proximity. This was by far a favorite rental home. We will most certainly be back again! We had such a lovely time here. We spent a week with my family including my then 3-month-old and the house was perfect. More than enough room for us, my parents, and my in-laws. 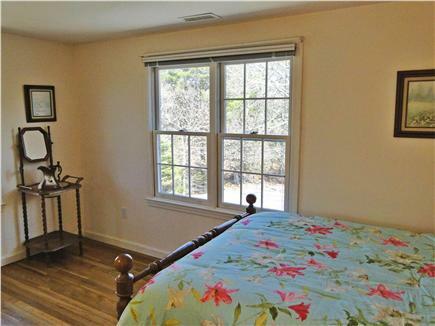 The master suite was beautiful, and the balcony was so peaceful. The kitchen was huge and easily accommodated everyone. 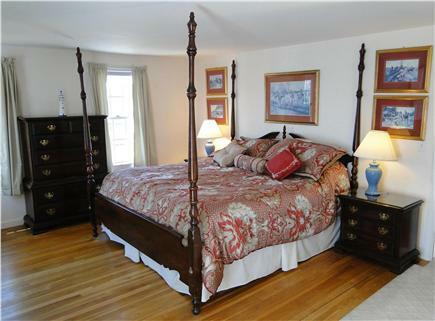 There were enough bedrooms with large beds to accommodate four adult couples and an extra bedroom with two twin beds. 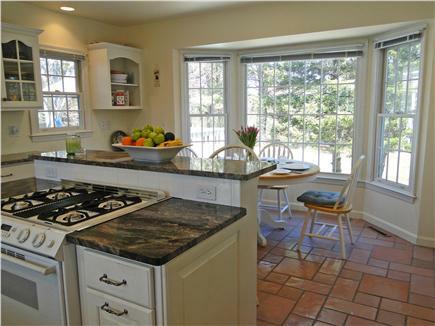 The house is centrally located to many excellent eating establishments as well as a beach. Many mornings we would walk down to the beach. Although it is a good walk, it's a great way to start the day. There are also a number of things to do in the area and a couple grocery stores. We have been taking a summer vacation on Cape Cod with our children for over twenty-five years. We have stayed in several homes and in several different towns. We had yet to find that "perfect" home . . . until now. 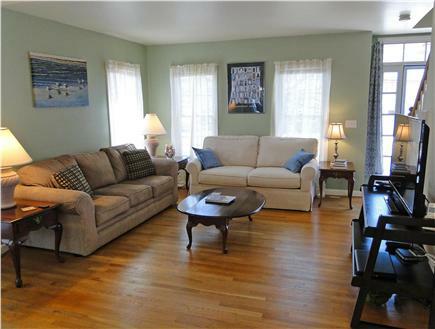 This property is warm and inviting, has all the conveniences of home, plenty of room (and rooms!) 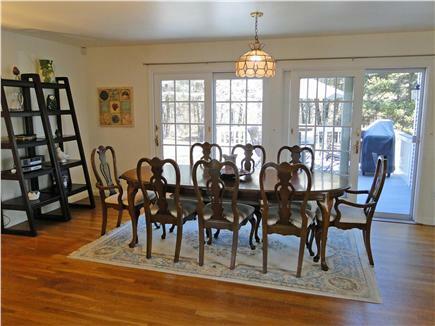 to spread out, and a table large enough to gather around for family dinners. 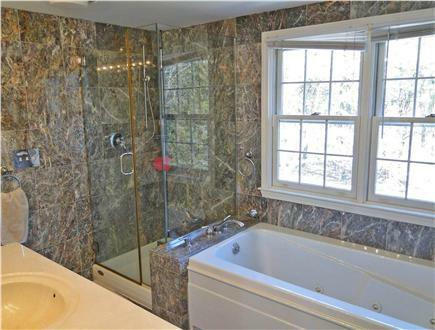 It is clean and very well taken care of, and the owners are exceptional to work with. My wife, my children, grandchildren and I have vacationed in this spectacular home for the past three summers. 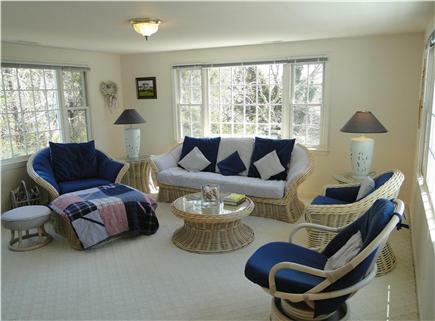 Everything you would want and more in a vacation rental is included in this property. Above all, the owners are not only wonderful people but extremely accommodating. We all look forward to our weekly stay, as it is the highlight of the year. What could be better than spending precious time with family in a dream home away from home! This home is not only beautiful, but the owners are warm and caring people. I could go on about how ideal the home is, but the pictures don't lie. This our third year vacationing at this property. The location is perfect, close to beaches, restaurants and shopping. The house is spacious and very comfortable for a large family. This home is truly a gem! My husband & I and our 9 month old twins had the pleasure of staying in your lovely home for 2 weeks - the first with my husband's family and the second with my family. The washer dryer and air conditioning were perfect for our babies. We loved all of the porches you have here and thoroughly enjoyed your deck as we had a delicious clambake in a beautiful setting. We look forward to making many more memories here! Thank you for opening up your home to us. We want to thank you for renting your lovely home to our family. From the long dining room table that could fit all of us, your gorgeous kitchen and beautiful deck to the air conditioning and laundry room- we loved it all! Having brought our children to the Cape for over 30 years and now grandchildren, countless memories have been made! We hope to make many, many more here! We treated your home as if it were ours...thank you for welcoming us! We hate to see it end.